First Lady Michelle Obama presents the 2011 National Arts and Humanities Youth Program Award to Sojourn to the Past. 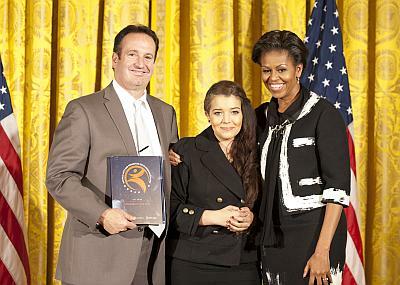 Accepting the award in the East Room of the White House on November 2 were Jeff Steinberg, founder and director and Andrea Gonzales, who participated in the program from California. The Award is the nation’s highest honor for after-school and out-of-school programs devoted to achieving positive outcomes for youth by engaging them in the arts and humanities. The awards are administered by the President’s Committee on the Arts and the Humanities, in partnership with the National Endowment for the Arts (NEA), the National Endowment for the Humanities (NEH) and the Institute of Museum and Library Services (IMLS). Photo is courtesy of Steven Purcell.